Give me all the veggies! This recipe started as an inspiration on National Taco Day. A bowl of goodness that is SO simple and so delish. Loaded with tons of veggies, it’s packed with nutrients. And it tastes so light and fresh, yet is totally filling. Place whole broccoli & cauliflower in a food processor and pulse a few times until is is "riced". 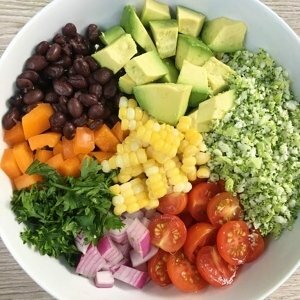 Combine avocado, black beans, orange pepper, parsley, red onion, cherry tomatoes, fresh corn and broccoli-cauliflower rice. Dress with a splash of olive oil, rice wine vinegar, salt and pepper.